I was too embarrassed to post on Earth Day because I think I got the most plastic bags when shopping ever even though I had just packed a bunch of reusable bags in my trunk. That might have been the day when I also sprayed the heck out of the weeds out back with Roundup. Anyway, as a family we are trying much harder to recycle. Our billing is paperless. I try to reuse a lot of items including fabric. I'm nowhere near as cool as my friend Scott (who deserves his own post by me in sheer admiration). His family was recently featured in the Milwaukee Metroparent magazine for their green efforts. Seriously, take a look at this family website to see all that they do. 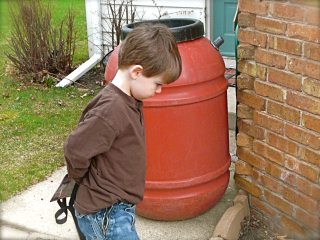 I took this picture of Aidan pondering how we are going to make our new rain barrel look a little prettier. Not sure if it is possible though it looks like we can paint it with outdoor acrylic enamel. We bought this rain barrel from the Milwaukee Metropolitan Sewerage District for $30 (recycled from cucumber barrels). The benefits of using the 55 gallon rain barrel is to reduce storm water runoff and also save money by collecting the water and using it during the summer to water your flowers or lawn. Did you know that 1 inch of rain provides 600 gallons for every 1,000 square feet of roof (statistic found here)? You can find out more about using rain barrels here. Thanks for the props, Sarah. Our rain barrel came in dark gray so it blends in nicely. We just started using ours and the rainfall from a few days ago filled it! I have it collecting a lot of the rainwater from the eaves on the garage. I couldn't believe that one rainfall gave us a full barrel of water. A trick is to stand it up on bricks or stones and let gravity help you use it when you want to hook up a hose to it. We hooked up the soaker hose to it and ran it to our new secret garden behind the garage. Beautiful boy! Who cares what color the rain barrel is? It will do the job no matter what!